Day 22. 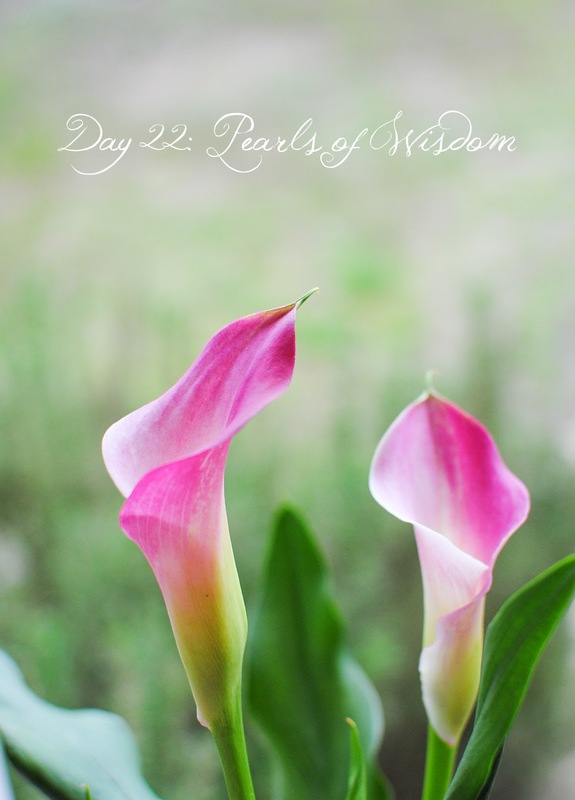 Pearls of Wisdom: Do you have any words of wisdom to share that you have found helpful? It could be from a writer, speaker, philosopher, maybe even a friend. Feel free to share quotes, poetry, song lyrics, or just ideas. I invite you to share a message of hope for all the newly bereaved parents and loved ones out there. I want to share some words from a letter written by John Piper to a lady whose son was stillborn. These words are incredibly comforting to me and I pray whoever reads them who have also lost their baby will find comfort in them as well. Please know that I know I don't know what it is like to give birth to a lifeless body. Only a small, sad band of mothers knows that. I say "lifeless body" because, as you made clear, your son is not lifeless. He simply skipped earth. For now. But in the new heavens and the new earth, he will know the best of earth and all the joys earth can give without any of its sorrows. I do not know what age - what level of maturity and development - he will have in that day. I don't know what level of maturity and development I will have. Will the 25-year-old or the 35- or the 45- or the 55-year-old John Piper be the risen one? God knows what is optimal for the spiritual, glorified body. And so it will be for your son. But you will know him. God will see to that. And he you. And he will thank you for giving him life. He will thank you for enduring the loss that he might have the reward sooner. God's crucial word on grieving well is 1 Thessalonians 4:13: "We do not want you to be uninformed, brothers, about those who are asleep, that you may not grieve as others do who have no hope." Yours is a grieving with hope. Theirs is a grieving without hope. That is the key difference. There is no talk of not grieving. That would be like suggesting to a woman who just lost her arm that she not cry, because it would be put back on in the resurrection. It hurts! That's why we cry. It hurts. And amputation is a good analogy. Because unlike a bullet wound, when the amputation heals, the arm is still gone. So the hurt of grief is different than the hurt of other wounds. There is the pain of the severing, and then the relentless pain of the gone-ness. The countless might-have-beens. Those too hurt. Each new remembered one is a new blow on the tender place where the arm was. So grieving is like and unlike other pain.